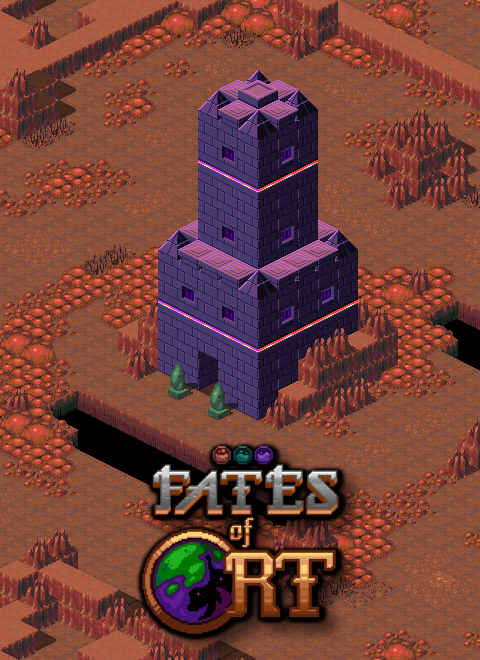 Fates of Ort is a retro inspired fantasy RPG with a focus on strategic action and a story driven by player choices. It is a tale of sacrifice and difficult choices, in a world under threat of annihilation by the avaricious force of consumption magic. There are numerous ancient forgotten spells, yearning to be learned and uttered once more. How each spell manifests in the world depends on what divine power you choose to combine it with – the unbridled passion of Life, the measured incisiveness of the Mind, or the devastating force of the Shadow. For example, the Evoke Force spell will cause the ground to erupt with a series of sharp ice crystals, summon a thunderous lightning strike, or barrage the ground with a meteor shower – all depending on what the spell is combined with. Magic is powerful, but it is not free. Every spell you cast requires a little bit of your life energy to spark it. Cast enough spells and you will extinguish your very soul. This means you need to be strategic when fighting, balancing the cost of magic with the risk of taking damage from your enemies. Replenish your life energy by approaching one of the magical spikes littered around the world, which were driven into the ground eternities ago to bind Consumption in the depths below. In Ort, time stands still when you do. This adds another dimension of strategy, as you are able to consider your moves carefully. There is nothing holding you back – as long as you are moving or performing an action, your enemies will come rushing to destroy you. Use this ability to mould time to your advantage by carefully avoiding projectiles and setting up elaborate traps to defeat your enemies. What's new in the development of Fates of Ort this week? We designed and implemented all of the maps for the fungal biome, the High Kingdom of Hyphae. This is an isolated island, populated by... Well, you'll just have to find out for yourself! We also designed and implemented the treetop biome. This is a set of structures high above the canopy of the deep forest. This area presented an interesting visual design challenge. We have a parallax layer of leaves, intended to convey a feeling of height. The problem was that we also had pillars that extended down. Where those pillars met the leaves, the effect was jarring and confusing. The solution we landed on was to extend the pillars beyond the edge of the map. This had the bonus impact of amplifying the illusion of height! We added some key NPCs to the courthouse in the grasslands, including a couple of bickering lawyers and a judge. This is an important area for a main questline. Finally, we worked on implementing some functions related to management of money in the game. Ort has three types of coins, each corresponding to one of the three Sisters and their respective element (Life, Mind, and Shadow). This means that there are cases where NPCs would like to only accept a specific type of coin, or a mixture of all three. We designed functions to handle all of these scenarios. That's it for this week! We'd love to hear your feedback on our progress.